High Yield bond provide higher income for investor. During the low interest environment, this taxable bond can provide additional income for investor. 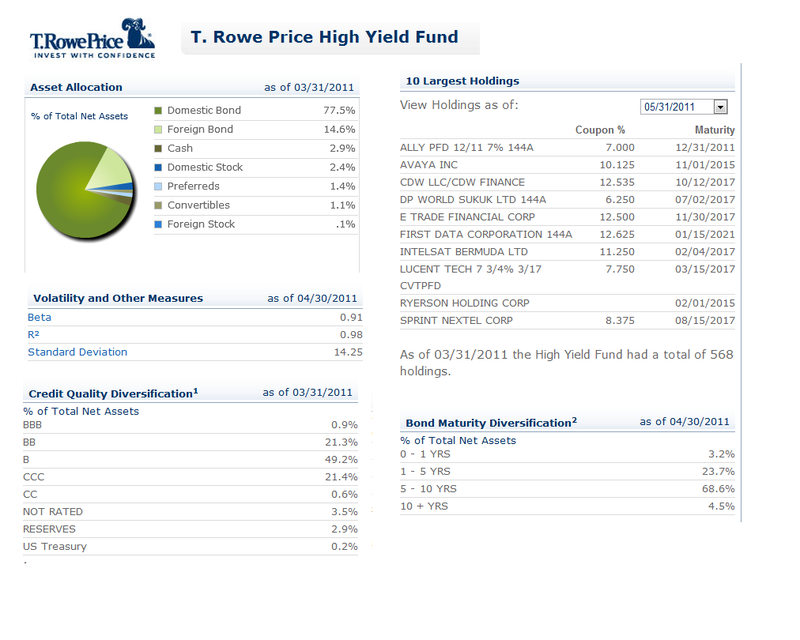 One of the best high yield bond funds is T. Rowe Price High-Yield. Details of the fund's review is as follow. The T. Rowe Price High-Yield fund investment objective is to seek high current income; capital appreciation is a secondary consideration. The fund usually invests most of assets (>80%) in a widely diversified portfolio of high-yield corporate bonds, income-producing convertible securities, and preferred stocks. High-yield bonds are rated below investment grade (BB and lower). Its weighted average maturity generally is expected to be in the 5- to 10-year range. This T Rowe Price fund may invest in futures, options, and swaps. 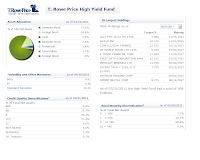 Since June 1996, Mark J. Vaselkiv has managed this top bond fund. The expense ratio is 0.76% per year. This expense figure is a lower than the average in the High Yield Bond category which is 1.17%. There is no 12b1 fee applies and no front-end sales load fee. This fund is now open to new retail investors. The fund’s dividend yield is 7.48%. The fund also has $8.58 billion total net assets. This high yield bond fund has a 4-stars rating from Morningstar. The best 1-year total return was recorded in 2009 with 49.16%. It has returned 17.97% over the past one year and 8.50% over the past five years. PRHYX has YTD return of 5.85%. Minimum balance requires to open a brokerage account in this fund is $2,500 with $100 minimum subsequent investment. For IRA account, the minimum initial investment is $1,000 with $50 minimum subsequent investment. PRHYX fund can be bought from 76 brokerages include E Trade Financial, T Rowe Price, Vanguard, JP Morgan, Common Wealth Universe, Scottrade TF, TD Ameritrade, Royal Alliance, etc. There are no other fund classes. As of March 2011, the assets allocation of this fund is domestic bonds (77.5%), foreign bond (14.6%), cash (2.9%), domestic stock (2.4%), preferred (1.4%), convertibles (1.1%) and foreign stocks (0.1%).